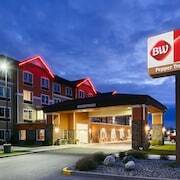 Situated in Okanogan, this hotel is within 1 mi (2 km) of Okanogan Bingo Casino and Alma Park. Okanogan County Historical Society is 1.8 mi (2.9 km) away. 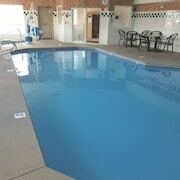 Situated on a river, this motel is within 1 mi (2 km) of Winthrop Rink and Mack Lloyd Park. Shafer Museum is 1.2 mi (2 km) away. The motel was well cared for and was welcoming. The rooms were large and comfortable. It was not as quiet as we thought it could be from other visits many years ago. Winthrop is getting to many rural homes from Seattle weekenders. Where did the horses go that were stabled by the bridge? Some of the restaurants are closed now. No real good spot for breakfast in town. Town needs an update. Where to find Okanogan hotels near an airport? 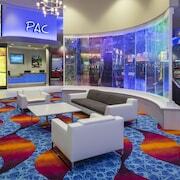 Where can I find hotels in Okanogan that are near tourist attractions? Expedia's comprehensive United States of America accommodation database features 7 hotels within a 0.1-kilometre (0.06-mile) radius of Okanogan. 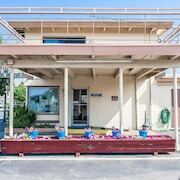 The nearest Expedia hotel is the Best Western Plus Peppertree Inn At Omak, Omak, located 20 kilometres (12 miles) from the center of Okanogan. Another handy alternative is the Blue Mountain Motel, which is situated in Okanogan, 17 kilometres (11 miles) from the middle of Okanogan. 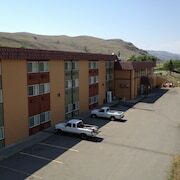 One of the very few cheaper accommodation options in Okanogan is the Quality Inn & Suites Okanogan - Omak. 20 kilometres (13 miles) from downtown Okanogan, is the Omak Inn. The Rodeway Inn & Suites is 20 kilometres (12 miles) away. The Columbia River Ranch and the 12 Tribes Resort & Casino are two more Expedia-listed Expedia-listed hotels around Okanogan. Why not see more of the mountains that are common in Central Washington? Choose to spend a few nights in some other parts of Central Washington. Whether you enjoy common local activities, for example rock climbing, hiking and camping, or simply tour around to explore the attractions, you will be able to reserve suitable accommodation in the region. 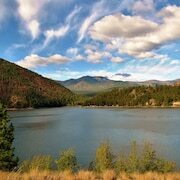 The closest accommodations in Central Washington are Chelan and Winthrop. Chelan is 65 kilometres (40 miles) to the southwest of Okanogan, while Winthrop is 60 kilometres (39 miles) to the northwest. 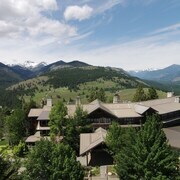 Chelan hotels are the WorldMark Chelan - Lake House and Riverwalk Inn. The Hotel Rio Vista and AbbyCreek Inn are some of the accommodation options in Winthrop. Our destination page is a great way to discover more about Okanogan. What are the most popular Okanogan hotels? Are there hotels in other cities near Okanogan? 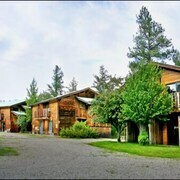 What other types of accommodations are available in Okanogan? Explore Okanogan with Expedia.ca’s Travel Guides to find the best flights, cars, holiday packages and more!